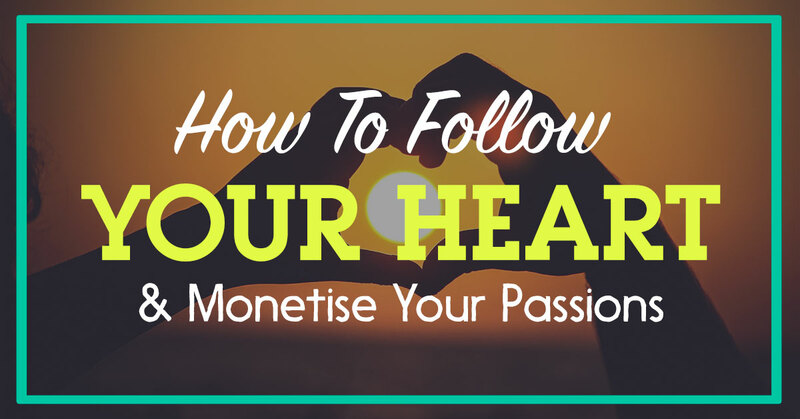 Do you want to know how to develop the courage to follow your heart and live your passions? Here’s some infromation which will be of use to you. I recently posted on my Facebook wall asking people to give me 10 questions to answer, and I would do some research on them. I received many questions and one of them was this, ‘ How to Develop Courage to Follow your Heart, Live a Life of Purpose and Monetize your Passions’. I did quite a bit of research on this, also linked it to my personal life using it as a case study and put together how I made it happen. When you actually go through this, you will view them as concrete steps to steer your passion and take charge of your life. While many of us are clear of what we want, doing it keeping money aside is where most of us stumble. How would you spend your day – What time you wake up, what time you sleep, how do you occupy yourself are all questions that need to be addressed and penned down. This will help narrow down your purpose. Let us say music is your passion and you wish to pursue it for life, ask yourself whether it will interest you consistently or will you get bored of it after a while. What is the mission you stand for – Initially you might want to take up a course to follow your passion, but is your end goal that of becoming a sound engineer or musician.You need to think beyond the immediate present. If you want to make music your profession, you will have to think in the longer run of making a mark on the music industry, or as an artist, having an impact on everyone through visual art. Spending some time in ruminating these answers will give you a clarity of thought. If money really were no object, would your passion be enough to drive you? A hard evaluation of your personality and skill sets will help you match your passion with the work you want to eventually pursue. 16personalities.com is a really cool site that describes personalities, to show you what kind of personality you are and where you fit. Roger Hamilton’s ‘Wealth Dynamics Test’ is another great test to understand your nature and interests. The site describes 8 different kinds of profiles, which will help you understand your flow and what kind of work suits that flow. In my case for example, being a mechanic suits my flow. A mechanic’s job is all about streamlining processes and structuring systems to make things work. Once I understood this, I started to focus more of my time as an entrepreneur in building a business where I can set up systems, processes and make things better. Wealth Dynamics is a paid test, costs $97. I recommend you to try it for yourself. Go through this link. Go through the link, complete the test, and you will understand your position as far as your wealth dynamics and flow is concerned. Make a list of top influencers in your space and study them – This helped me a lot in charting my course. I made a list of top influencers in the internet marketing and social media space, went through their blogs, the different books they have written, went through their Youtube videos and made a list of different things that they stand for. I gradually started to incorporate or model some of their teachings and successes into my life and work. So as a second step, evaluate yourself in depth, to see where you can fit into your niche. The first step in this is to register for a website called coach.me, which is a really cool free site. There are different coaches registered there, which are available in the paid version. The site is all about committing yourself to a challenge.If you want to do something on a daily basis, like write everyday, study everyday, or start saving money daily, develop a consistent habit or get more healthy, the site helps you stay the course. There are many challenges you can take up and again based on your industry, you can decide the kind of plunge you want to take. To register, first go to coach.me, set up an account, pick an accountability partner, set up a 30-day, 40-day or even a 90-day challenge and get into the habit of being consistent with your plans. Make a self-education plan, create a routine and DON’T BREAK THE CHAIN. Let us say for example, you have set yourself an education plan of watching a video for 5 minutes every day related to the particular subject you want to get into once you decide to take the plunge. If music is my passion, I will embark on researching and learning from other musicians daily for 5 minutes every day. I will maybe go through their blogs, their videos and gradually make self-education a routine. It could mean reading books or watching videos. Once you begin this, don’t break the chain. What I mean to say, is that if you have set yourself up for a 90-day challenge, make it your purpose of doing that task every single day. Some of these insights, I have applied to myself and noticed how the consistency breaks through a set pattern. Often in life, we get comfortable in a routine. Any different task creates excitement which may last for just a single day & then fizzle out. Sometimes, other people’s opinions really don’t matter. The concept of minimalism, is all about having less so that you can do more. Get rid of clutter in your life, from your wardrobe, your cupboard and every other materialistic place. Follow your heart. Start a 90-day challenge – Pace a challenge period, so you are mentally prepared for the time period you will be involved in staying the course. A 90-day challenge is a period that will develop consistency and increase commitment. Start daily journaling of your success – A daily journal, makes your effort more tangible. It can be 4-5 lines of text, or 100 words based on what you have achieved for that day. This daily action taking step will show that you have the courage to take that plunge. This is the time to make a basic business plan. Let’s consider photography as an example for this. Goal 1 – Outline your deadline – This is the time period you going to give yourself to quit what you’re currently doing. You have a great job, receive a good paycheck, are hired by a great company, but then you aren’t happy, and nor does it resonate with what you want out of life. Put down a number board for this passion. Give yourself the next 12 months to work on acquiring skills that will eventually make photography your full-time profession. Goal 2- How much money do u need to make per month to sustain your family? Design number board that details the basics; cost of living, home, food and rent. Goal 5- How soon do you want to find a business partner or investor for your concept. Finding a well-wisher who can help you take that plunge is important, since it gives you more confidence. People often do all the planning, but don’t follow through. Trust your gut and follow your heart. Do not show your idea to anyone and everyone. Keep your idea confidential and share it only with true well-wishers. Be discreet and don’t share all details. Often negative opinions can cloud judgements because not everyone shares a similar line of thought. When it comes to confidence in taking the plunge, follow your gut. Even if you make mistakes, it will really help you make the right decisions as you move on. Don’t worry about mistakes. They are just lessons that help learn and grow. Slow Track Plunge (Plan B Formula) – Are you a ‘Weekend Warrior’? You may have a regular job and want to start slow by engaging in your passions over the weekend and working on your interests. Fast Track Plunge (No Plan B) – Although not for everyone I’d definitely recommend this move. if you find a way to finance yourself for the next 12 months, you can step on it and work on your passion right away. In 2011 I did the same. I took a one year sabbatical, funded myself for 12 months and learnt internet marketing like a maniac. That’s how Scion Social was born. I’ve seen how effective the formula is, applied it myself and it works. Work on your passions in this order, in a planned structured fashion, go where your heart takes you and earn while indulging in your passion. I would recommend you to check out this system, which can help you with a solid educational system and a personalised coach to help you break out from your current situation and live a life of purpose, by levaraging the internet.